Our luxury apartment in Brussels is conveniently located right in the City center, at a street corner from the Prestigious Avenue Louise and the Historical Place Stéphanie. This luxury 3 bedrooms, 2 bathrooms luxury apartment, Louise Stéphanie IIID in Brussels, makes for an ideal starting point for travelers looking to explore the City many Landmarks. Its close proximity from the Palace of Justice, the Stock Market place and a multitude of Embassies, is also very advantageous for Financial and Political workers. The construct structure is made of two large luxury mansions built in the late 17th century by architect Marshal Gerards. Recently renovated, the old building has conserved nearly all of his historical aesthetic and is characterized by an unusually rich ornamentation. The roof is made of Bluestone top and the white stone facade is decorated all throughout with original molded frames. Each floors have large bay windows each surmounted by a cornice with vertical piers and framed by a border of pearls and decorative spandrels. The balconies are supported by a caryatid and two atlases, all three wrapped and sculpted by the renowned Belgium Sculptor Julien Dillens. Inside the building, a luxury and spacious marble entrance hall leads you to the elevator. There is also a secure gated parking for the guests traveling by car. The three bedroom, 2 bathroom apartment has retained nearly all of its period features, notably the 11feet high ceiling, which certainly gives the visitor a sense of arrival. The two baroque balconies add even more to the presence of this charismatic apartment. Julien Dillens the famous Belgium sculptor wrapped and sculpted the caryatid and two atlases holding up the balcony balustrades. 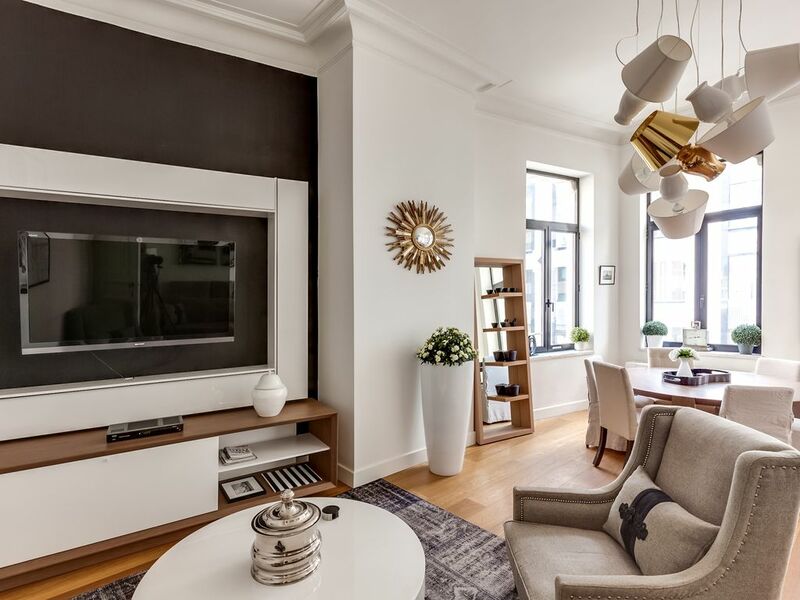 A beautifully decorated apartment offering a superb living space, our luxury apartment rental in Brussels, Louise Stéphanie IIID, is perfect for sharing with friends or another couple. The open plan kitchen has been modernized to a very high standard and benefits from the very best in kitchen fittings, between the touch control ceramic cooking hob, the steam oven, microwave oven, the electric plates warmer and the wine cooler, you can concoct your meals just like the professionals. Very spacious and comfortable, the kitchen, which is located in the center of the apartment, makes a great common area to share laughers right from breakfast. The second living area is very light and airy room shared between a lounge area and a dinning area. The lounge is place to your home theatre, you can watch your favorite program on the 48 inches flat TV, plug your laptop to the TV for a better viewing experience, or simply relax, listening to music on the stereo while sipping a perfectly chilled glass of wine. The dining area is a great place to socialize around a meal, the dining table can seat up to 6 people. Alternatively, you can enjoy the sunny days by taking your meal on the balcony. For days when you don't feel like cooking there is a large choice of local restaurants and convenience stores from which to pick from. The rue Dejoncker, just at your doorstep, is filled with bistros, pubs and restaurants in which you can order from a light lunch to a full on Belgium specialty. The market store Carrefour and the French baker chain, Paul Bakery, are just 2 mins away. The Place Marolles (20 minutes walking distance) is home to the most popular brocante in Brussels, you can find a variety of unusual objets. It is also home to the `Marseillais' a french café terrace famous for its large variety of Pastis, popular drink from the south of France. The first bedroom is furnished, among other, with queen size bed with a leather bed head. A large mirrored wardrobe, flat screen TV and a desk with assorted chair. The second bedroom is furnished with 2 single beds which can be easily put together to form a queen bed. The mattress have been designed specially for this purpose and so there is no uncomfortable gap between the beds. The single bed also have a leather bed head and a large wardrobe. There is a large bathroom located between the two bedrooms. The bathroom has a toilet, two sinks, shower and a bathtub. The third bedroom is very large and is furnished, among others, with a king size bed with leather bed head and many more furnitures including, among other, a vanity desk complete with chair, a leather foot rest, a long chair and a gueridon table with chair. The bedroom also benefits from an impressive wardrobe, furnished book case and its own private access to the second balcony. The second bathroom has one sink, toilet and shower. Additional rooms include a laundry room fully furnished with a washer and a dryer. For the past 15 years, welcome2france has assisted and served many guests in creating timeless memories through our different apartments rentals. We take pride in our stunning repertoire of properties suited for both long and short term rentals and in our expertise of catering to our guest's needs. We offer unique services, with the aim to enhance your rental experience. Our team of concierges are locally-based and ready to assist you before and during your stay. You are welcome to book directly through our site Welcome2France. Either way, we look forward to having you as our guest! Conveniently located right in the City center, at a street corner from the Prestigious Avenue Louise and the Historical Place Stéphanie. The 3 bedroom apartment, Stephanie IIID makes for an ideal starting point for travelers looking to explore the City many Landmarks. Its close proximity from the Palace of Justice, the Stock Market place and a multitude of Embassies, is also very advantageous for Financial and Political workers. The construct structure is made of two large mansions built in the late 17th century by architect Marshal Gerards. Recently renovated, the old building has conserved nearly all of his historical aesthetic and is characterized by an unusually rich ornamentation. The roof is made of Bluestone top and the white stone facade is decorated all throughout with original molded frames. Each floors have large bay windows each surmounted by a cornice with vertical piers and framed by a border of pearls and decorative spandrels. The balconies are supported by a caryatid and two atlases, all three wrapped and sculpted by the renowned Belgium Sculptor Julien Dillens. Inside the building, a spacious marble entrance hall leads you to the elevator. There is also a secure gated parking for the guests traveling by car. Central location in prestigious Avenue Louise. Close proximity to city landmarks and local amenities. Oh my gosh. This property was stunning and delightful. Super clean, well equipped, well appointed, spacious, wonderful location, user friendly. The representative met us at planned time. She was lovely, met all of our needs..we were a party of 5 adults and a 1 year old. Plenty of room. We asked permission and held a birthday party/lunch. It was such a great gathering place. We cannot say enough about this apartment. If you think the pictures are nice, in person it is even better. I would love to live in this apartment!! Having a washer and dryer was super. Private parking great. We cooked some meals in the fab kitchen. There was a book compiled of very, very helpful instructions and resources, suggestions. Just one thing, add a few more towels..easy...and we give you 10 stars out of 5!!! Thank you. Great apartment, it was just as described- open, great kitchen, spacious rooms, great location and neighborhood, easy access to public transportation. We loved it... Plenty of space for five adults, every appliance you can imagine, located in the middle of everything including a bakery steps away, grocery store on the next block, a bank close by, just a few blocks to the Metro and plenty of restaurants and bars. The super high ceilings made the space feel so big and open. Being in the middle of everything means you will get street noise, especially in the Master bedroom. Light sleepers will wake up to sirens, horns honking, light rail etc. If you want to sleep in and need total peace and quiet this will be an issue. If you want to get up and get to the sights it's no issue! The apartment itself is such a pleasure to be in! Our family of four stayed a week at the Louise Stephanie I apartment. The welcome was warm, efficient and our host was extremely helpful and welcoming. The apartment itself is such a pleasure to be in, every comfort and a large sofa to watch the enormous television from whilst watching the snow fall outside. Slept like a log every night, extremely quiet considering such a central location a few minutes walk from the metro station and shopping area. Also very easy to walk to other areas from the apartment. Thoroughly recommend. We had a fantastic stay at this apartment in Brussels. Such a perfect location (close to tram, subway, Ave Louise grocery stores, etc) Wide array of excellent restaurants are abundant and all in walking distance. Even some good (non-Belgian) bars/restaurants if need be. We were big fans of Michael Collins Irish Pub...an easy walk away. Great Belgian beers with some comfort food and American Football to remind us of home. The apartment itself is absolutely gorgeous. The pictures online are obviously very nice, but still fall short of doing it justice. Very high ceilings and high-end everything made it a wonderful place for my wife and I to spend some time in Brussels. I am a very big fan of renting apts/flats when traveling abroad, and am relentless in my online searching for the perfect place to stay. If this apartment is even close to being in your price-range, look no further!! Even if you have to stretch a bit, it will be worth the splurge. Also, not that you need/want a car in Brussels, but there is a private parking space that comes with the apartment. We were driving in from France and needed the car park for a night before returning the car, so was a very nice bonus as well. I could easily see it being the nicest apartment we ever rent. Don't look further! The perfect place to stay in Brussels! We had a fantastic stay at this apartment in Brussels. Such a perfect location (close to tram, subway, Ave Louise grocery stores etc) Wide array of excellent restaurants are abundant and all in walking distance. Even some good (non-Belgian) bars/restaurants if need be. We were big fans of Michael Collins Irish Pub...an easy walk away. Great Belgian beers with some comfort food and American Football to remind us of home. The apartment itself is absolutely gorgeous. The pictures online are obviously very nice, but still fall short of doing it justice. Very high ceilings and high-end everything made it a wonderful place for my wife and I to spend some time in Brussels. I am a very big fan of renting apts/flats when traveling abroad, and I am relentless in my online searching for the perfect place to stay. If this apartment is even close to being in your price-range, look no further!! Even if you have to stretch a bit, it will be worth the splurge. Also, not that you need/want a car in Brussels, but there is a private parking space that comes with the apartment. We were driving in from France and needed the car park for a night before returning the car, so was a very nice bonus as well. Most famous for its Louise quarter, this uptown area of Brussels is both an important business center and a prominent hub of up-scale shopping and entertainment. The well-known Avenue Louise offers stylish restaurants, trendy bars and fashionable boutiques. At the end of this lively street, you will find the beautiful urban park of Bois de la Cambre, situated on the edge of the Sonian Forest. Visit the Abbey of La Cambre with its landscaped gardens. The wonderful Ixelles Ponds and the Tenbosch Park also provide nice settings for a leisurely walk. Pay a visit to the Ixelles Museum of Fine Arts or walk around the Ixelles Cemetery to discover the names of celebrated artists and writers. The stately building of the Law Courts of Brussels is well worth seeing.The Sablon area and its numerous antique dealers is also nearby, leading on to the famous Grand Place. From Brussels South airport (Charleroi) : bus shuttle to gare du Midi.? IF you get off the airport train at Gare Centrale/ Centraal Station: From the central railway station, you should procede 200 metres to the Place Royale. Take the tram 94 from Place Royale direction Musée du Tram. you should then get off at the 'Stéphanie' stop, on the Chaussee de Charleroi. IF you get off the airport train at Gare du Midi / Zuidstation (the next stop after Gare Centrale):You can take the Metro directly from Gare du Midi to Avenue Louise (Line 2 direction Simonis, 3 stops). From Avenue Louise the apartment is within walking distance (5-10 minutes). You should follow Avenue Louise and walk straight towards Place Stephanie. You will pass shops and restaurants including Burger King, Haagen Daas, Inno and Zara on your way. Get out the tram at Place Stéphanie, walk on the Chaussée de Charleroi and take the second right. Traveling time = 13 mins.